If you've ever wanted to customize a Breyer horse model - move its legs, add a hair mane and tail, repaint it, add horse shoes or fix a bent leg - here's your chance to learn from other collectors. Collectors shared tips on what they wish other people in the hobby had told them when they were first learning how to customize their model horses. 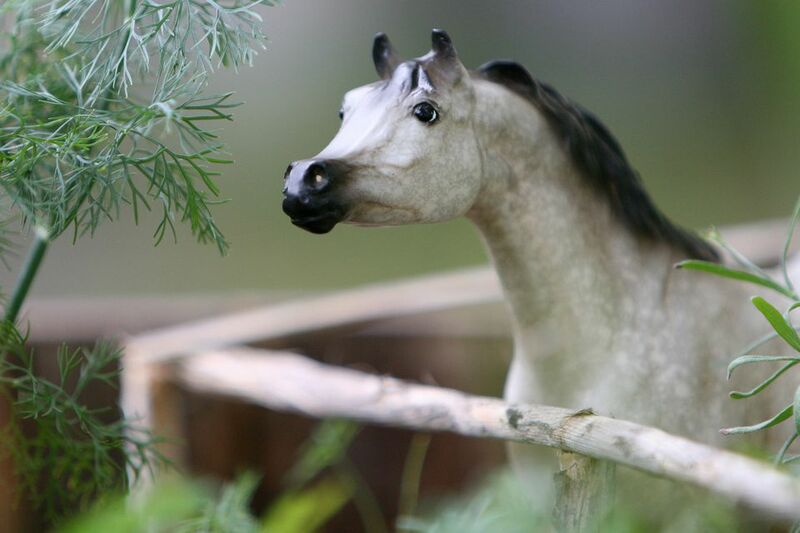 Use these tips to get started making your own original customized Breyer horse models. Don't be afraid to experiment! Many collectors wish they had been more adventurous at first. Don't be afraid to try a project, even if the results aren't what you hoped they would be. Learn how to prep your own models. It's hard to find a good prepping artist to work on model horses such as Artist Resins. Learning how to create a smooth, even surface area for painting projects saves you time and money. Create a good reference library.It's better to clip pictures from magazines or print them from websites of breeds, coat patterns, poses and props for future projects as you encounter them than to try to find an exact shade of palomino or roan, for example, when you want to sit down and paint. Collecting pictures and organizing them in a model horse reference library makes it easy to work on a project when the inspiration strikes. Try different primer sprays. When a group of customizing artists were asked which primer spray they recommended, responses varied widely. Some artists swear by gray automotive primer, claiming that the gray creates a good neutral base coat that accepts most colors without changing the desired effect. Others claimed that a base coat darker or lighter than the intended horse's coat color works best. No matter which customizer responded to the query, they all said they tested many products before finding the one that worked best. You may want to experiment too with various primer colors and types to find the one that works best for you. Work in thin layers of paint rather than trying to put lots of paint on to get a project finished. All of the painting artists responding to the request for tips said that it is better to work in thin layers of paint than to try to paint a model horse all at once. One artist who wished to remain anonymous said, "I made my worst mistake rushing to get a model ready for a show. I glooped on the paint instead of working in layers, and boy was I sorry." Thin out your paints and work slowly, building up layers of colors. Work slowly! Along with working in thin layers of paint rather than one thick layer, most customizers mentioned the need to work slowly. Rushing, it seems, leads to all sorts of mistakes. While you may be eager to complete the project, rushing can ruin a project (see the comment in #6, above). Organize your work space. Stacy Quick mentioned keeping your workspace neat and organized. Others mentioned having a dedicated work space, rather than just working wherever you can. If you don't have the space for a dedicated work room or table, at least have a project box where you can store your leather, paints, paintbrushes and other creative tools. This keeps them neat and organized. Don't be afraid to ask for a critique.It's true that people can be harsh and make mean or negative comments on your work, but it's just as true that you can learn from sharing your work. Visit hobby bulletin boards and post photos of your work in progress. Go to clinics and model horse shows to meet more experienced customizers and ask for advice. People gladly share information, if you ask for it. Learn more about real horses. The model horse hobby closely follows the real horse world in everything from show clothing trends to judging rules. While it's hard to become an expert on every aspect of the horse world, keep up with your favorite aspects of the sports by following websites and breed or show associations of interest. Whether you want to add a hair mane and tail or create a model horse from scratch, use these tips to help you transform your favorite Breyer horse into an original customized horse model.